Do you want to use the Standard, Premiere or Premiere Plus service? Where can I get the Ferry from in Hong Kong? The SkyPier is located inside immigration inside HK airport (so you can disembark from your flight and get the Macau Ferry direct without having to exit Hong Kong immigration). On disembarking your plane – just follow the signs ‘Ferries to Macau’ – the desks are located right inside immigration – so you naturally flow towards them. Give your luggage tags to the staff when you book the ticket and they will pick up your luggage for you and take it direct on your Macau ferry. 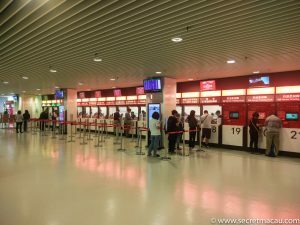 You do not need to go through immigration control at Hong Kong, or pick up your luggage – you will do this when you arrive at Macau (and your luggage will be waiting at the Macau Ferry Terminal). Note: this is not open 24hrs a day – so you may need to wait if you arrive very early in the morning (I’ve always tended to get the red eye flight from the UK – so usually arrive in HK late afternoon). 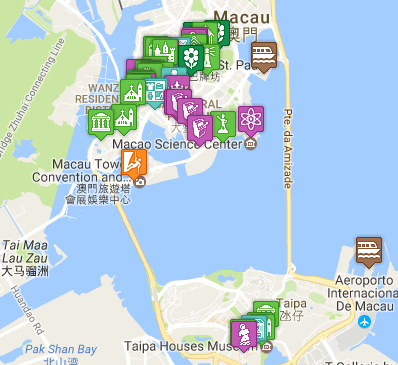 Do you plan to go to Macau direct from the Airport? Do you plan to go to Macau after you have gone through immigration at Hong Kong? There are several terminals in Hong Kong providing ferry services to Macau. 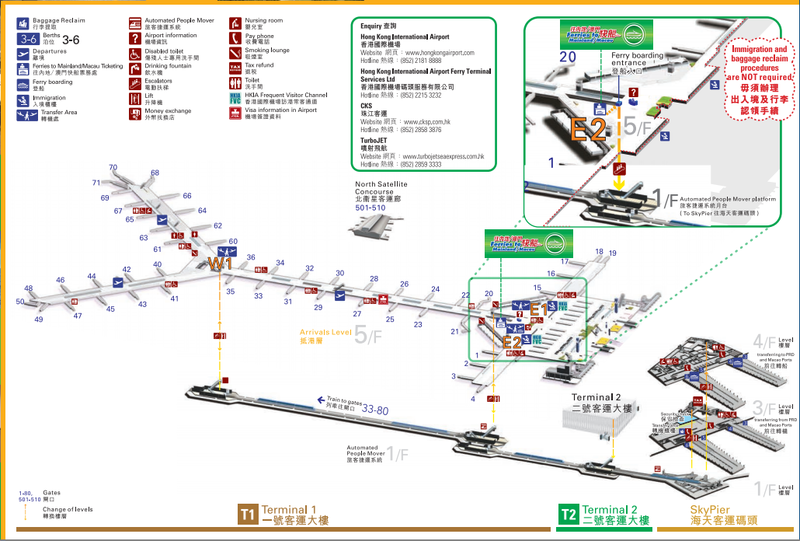 The main one is the ‘Hong Kong-Macau Ferry Terminal’ (港澳碼頭) which is in the Shun Tak Centre, in Sheung Wan. This includes a shopping centre and office facilities – and has easy transport links via MTR (Sheung Wan Station), Bus or Taxi. 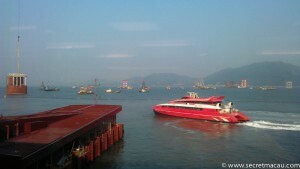 It provides services to Macau Outer Harbour Ferry Terminal, and the Taipa Temporary Ferry Terminal. 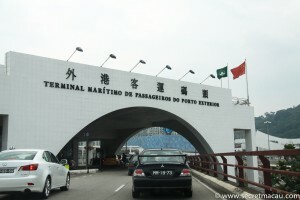 The Hong Kong China Ferry Terminal (‘中國客運碼頭’) provides Ferry services to Macau – Taipa terminal. It is located in the ‘China Hong Kong City‘ (‘中港城’) commercial complex in Tsim Sha Tsui (Kowloon). This is a large shopping/commercial complex. The ferries are run by two different companies – Turbo Jet and Cotia Water Jet. Both of these run regular services, taking just under an hour usually to make the trip. The Ferrys are large and fast. Seats are allocated when buying the tickets, and they are usually not all that busy. It is possible to take first class seats – which lets you sit on the upper deck, but the regular seats are just fine (for such a short trip). Refreshments are available on board (and first class passengers get a light snack provided). The Outer Harbour Ferry Terminal (‘外港客運碼頭’, ‘Terminal Marítimo de Passageiros do Porto Exterior‘) is the main Ferry Terminal in Macau, with 14 berths available (and a Heliport, if you’re feeling flush). It has duty free, with a car park, taxi ranks and bus stops outside (include shuttle buses to many of the casinos). 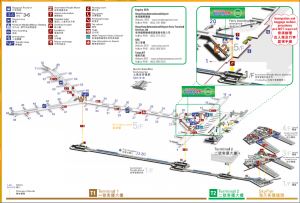 It’s still easy to get to Taipa from this terminal if you need to – the Casino shuttle buses will take you directly, or via the taxis or public bus system – but you may want to consider the Taipa ferry terminal if that is your primary destination. 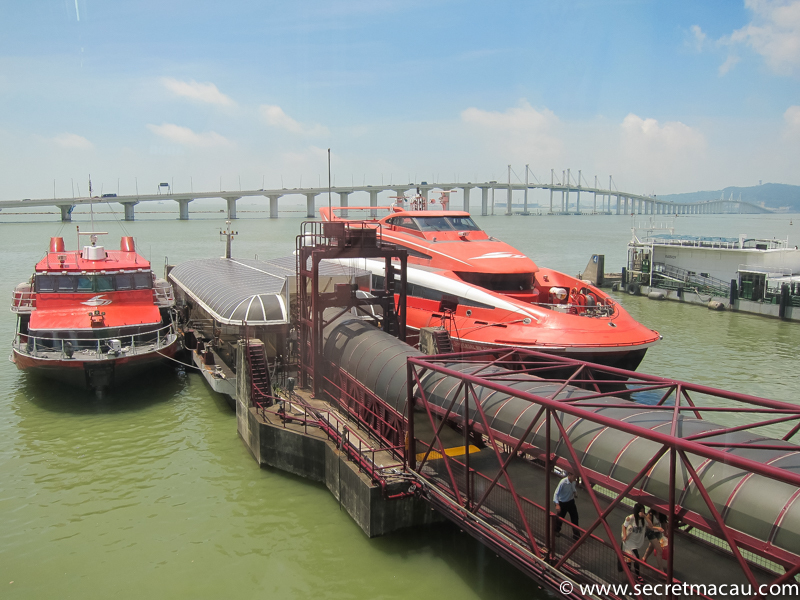 This Ferry terminal is on Taipa Island, close to Macau Airport and the Venetian Casino. It also has a bus stop, taxi rank and Casino shuttle buses. This is soon to be replaced by a new terminal – currently under construction. You will get a seat allocated on the main ferry desk. After buying your ticket at the kiosk – make your way to the Ferry gates about half an hour before departure. Show your ticket at the gate, and they will allocate a seat to you (by placing a sticker on your ticket). Just wait in the waiting area and board when called (usually 5 mins before departure). This is an option from TurboJet. Similar to Premiere, but with the added extra of a free transfer from the Macau Ferry Terminal to anywhere in Macau in their dedicated shuttle bus. This is what I’ve used the last couple of years when travelling to Macau (about 6 trips) – it’s just so convenient when you have luggage and arrive straight from the airplane. It does involve a transfer to Sheung Wan by bus (I think this is just because currently the Ferries from the Airport are affected by the building of a new runway – so it can be quicker and more convenient to do this). When you assemble – there may be a small group of you with the sticker – a member of staff will take you through immigration, and meet you at baggage claim – where porters will collect your baggage. At Shun Tak – another member of staff will meet you, and porters will unload your bags. You will then be escorted through the Shun Tak centre to the Ferry gate (this can be a bit frantic at times if time is tight and the Shun Tak centre is packed with tour groups from the mainland – all good fun though). At Macau, someone will meet you, take you through immigration, collect your bags and take you to a shuttle who will drop you off wherever you choose. 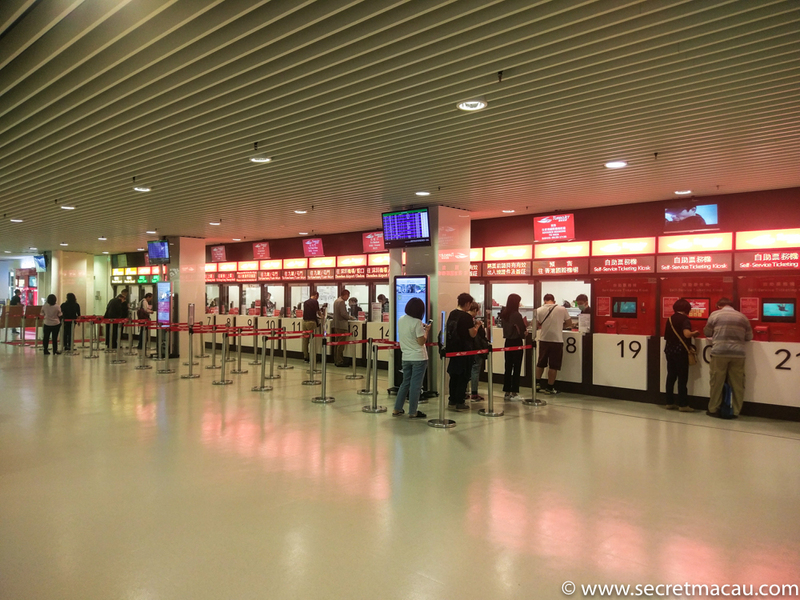 In Macau you can buy tickets from the Ferry Terminals. There are dedicated booths for purchasing tickets in advance (i.e. days ahead), and for buying tickets to Hong Kong Airport (be prepared to show passport and e-tickets if getting ferry direct to Airport. Note: you cannot leave the airport – you get off the ferry and go straight through security for departures. If you wanted to explore Hong Kong before getting your flight – you need to choose one of the other terminals in Hong Kong. You can check in luggage at the ferry, and take small cases on-board (they have a case stacking area). Check on your ticket for allowances, extra can be purchased at check in if needed. If you are heading direct to the airport and flying with Cathay Pacific – you can get your luggage checked all the way through to your destination. For other airlines you need to pick your luggage up from the belt in the Skypier (this is just for people arriving by ferry) – and check in at the row of check in desks lying next to it. From there you go direct through security, and hop onto the free train direct to the Terminal (note: there is a small desk at the top of the escalator just behind security where you can claim the tax back on your ferry ticket. That is all this desk does – you don’t need to say anything – just hand in your ticket and you’ll get a few HKD back).